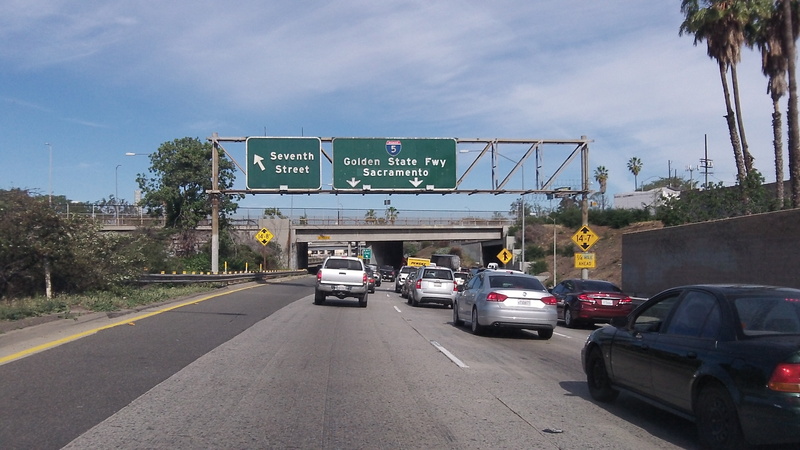 On I-5 in LA, not far from Vernon, where city workers far outnumber permanent residents. California residents were no doubt interested to learn last week that Kern County paid a contract physician more than $1.3 million in 2014, and that in the city of Burbank a police sergeant earned $592,625, making the doctor and the cop the highest paid county and city workers, respectively, in the state. The state controller, Betty T. Yee, has just issued her annual report of city and county payroll information, something that Oregon doesn’t have but I wish we did. Yee’s predecessor, John Chiang, started compiling these reports in 2010 after a financial corruption scandal erupted in the city of Bell. Chiang ordered municipal governments to supply payroll information, using the authority of two sections of the California Government Code. The 2014 report came out last week. Among other things it highlighted the peculiar city of Vernon, which has just 123 residents but more than 200 city employees pulling down an average of $103,601 a year in salary each plus more than $32,000 in health and retirement benefits. Oregon prides itself on transparency, but this pride is undeserved. On the state level, online payroll information is hard to access and does not include benefit data. For local governments, it may be possible to extract or calculate payroll data from individual city and county budgets, but it’s not easy. This information would be of interest to many taxpayers and voters. Citizens can ask for it but, likely as not, at least at the state level their public-records requests would be met by demands for stiff fees to compile the requisite lists. Wasn’t Mike Belloti (former Ducks football coach) a state employee? Hired by a university’s athletic dept. with no salary controls. I’ve heard he gets $500,000/yr. retirement. It’d be interesting to see a list of the highest paid state retiree’s. You can also click on the categories to sort by them. Sort the time of service, and you’ll see they are paying some pensions to people that apparently never worked for this “system”. Back in 2011 when you were the editor of the local paper the payrolls of the city and county were published. It was very helpful to have this insight into where our property taxes go. Over a year ago I asked the editor to publish current lists. Evidently the paper is no longer interested or things run slower because nothing has been provided. And we know the city won’t take the initiative and provide this information on its own as a public service. Like you said, pride in government’s transparency is undeserved. If you want it just ask, or ask that your government organizations put it out on some regular basis. I know the city has never turned down posting that info. Be aware though that some data spikes occur. The payroll reports track what has been paid, and that can give a big bump to an individual that has retired and had a lot of accrued vacation leave that is paid out. While there are limits on how much leave can be accrued, for a given individual it can be a tidy sum. Ditto for folks who get a lot of overtime which can especially happen for police and fire personnel. So, if you want to see how much money an individual got, the payroll reports have it. If you want to see how much a given position (clerk, engineer, police sergeant, department director) gets paid on a normal basis then those salaries ranges are shown in the budget every year. And remember that management employees do not get overtime. But they can get that leave payout on retirement. And just HOW can you possibly know the City has NEVER turned down posting “that info”? WHERE did they post it? You really need to quit living in your Fantasy Land! “Debt Service Fund: Increase Property Taxes $964,900 and Interest Income $500 to reflect payment on GO Bonds for the Public Safety Facilities bond…..
GOSH Ray! It IS a Tax Increase! “Debt Service Fund: Increase Property Taxes $964,900 and Interest Income $500 to reflect payment on GO Bonds for the Public Safety Facilities bond measure passed by voters on May 19, 2015. The city cannot arbitrarily increase property taxes. That is 100% done annually by the Linn County tax assessor. They go up and down. The budget has to reflect those consequences of that actions.